Angels in time and histories combined. We start in 1967, when a new genre of collectible coins was formally established. The initial release of the gold Krugerrand in that year started not just an international coin rush, but a new era of coins specifically struck to get precious metal into the hands of people across the world. Now let’s go some 5 centuries further back in time, to the reign of Edward IV. In 1465 - a short 20 years prior to the medieval War of the Roses. A coin that is now revered as one of the finest ever designs ever to feature on British coinage was introduced for the first time. The Angel was introduced and featured Archangel Michael slaying the dragon for the very first time. As treasured touchstones of good fortune and health, Angel coins were often passed down through generations as a family legacy – supporting many myths and legends that encourage Angel coin owners even today. Fast-forwarding back to a time nearer to now, the historic Angel was re-born – depicting a slightly modernised strike of the iconic medieval designs. Following on from the introduction of the Krugerrand, the first Modern Gold Angel was struck for the Isle Of Man in 1984 – the very same coin winning the coveted Coin of the Year crown in 1986. In fact, this very series of coins soon became dubbed “Krugerrand killers”, as a not-so-coincidental drop in the form of Krugerrands through the 80s lead to many collectors worldwide turning to the new and beautiful Angel coins as their chosen alternative. It’s now nearly impossible for Angel owners not to seek out this romantic connection and covet the modern Krugerrand, and the same can surely be said for the opposite. Furthermore, the Angel was soon to be released as fine Silver Proof for the very first time. 1995 heralded this first. Years after, Fine Silver Angels are always set to sell-out nearly as quickly as they become available. 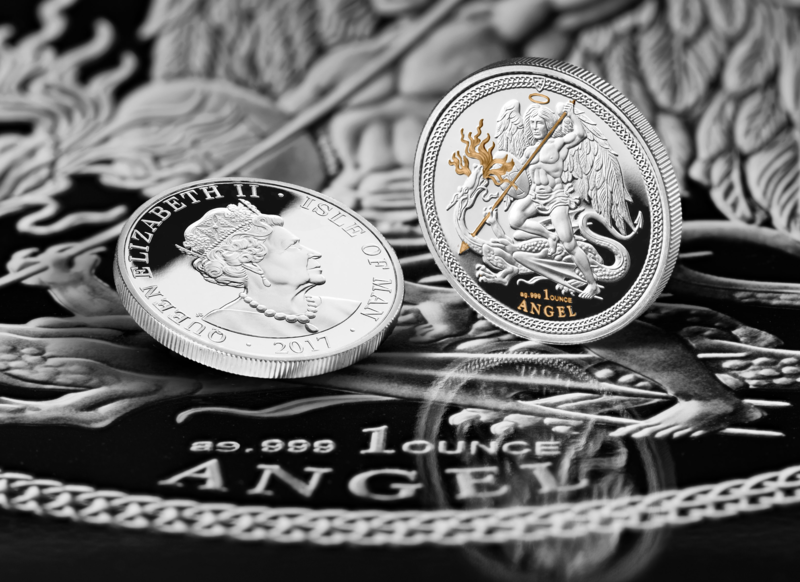 This year, The Dublin Mint Office have the opportunity to offer the exclusive Silver Angels to our customers. If you regularly covet the Angel, Krugerrand or have not yet had the opportunity to own one, then this could very well be the best and only opportunity that you have in 2017.